World news and international media coverage of development and sustainability issues are important indicators and influencers of awareness, understanding and involvement. 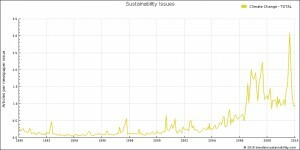 How has the news media’s coverage of issues like sustainability, poverty, biodiversity and HIV changed over time? 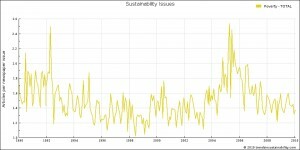 An interesting web project called Trends in Sustainability helps address this question. 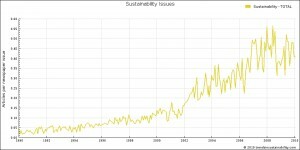 The Trends in Sustainability Project and interactive web tools measure the level of world news and media coverage related to important development, environment and world health issues. The project tracks the appearance of related key terms in newspapers around the world. The site’s newspaper article database, part of a text mining exercise at Queen’s University in Ireland, encompasses 115 newspapers from 41 countries with articles dating from 1990 to the present. As of mid-2010, the database contained a total of 69 million articles from 369,000 newspaper editions. The analysis focuses on national newspapers based on three main newspaper selection criteria: circulation, area of circulation and, if possible, private ownership. The 115 newspapers in the study sample are written in eight different languages: English, French, German, Spanish, Portuguese, Dutch, Danish and Italian. In the cases of national newspapers from Russia, Japan, China (Hong Kong) and South Africa, the analysis was restricted to papers with English language editions. 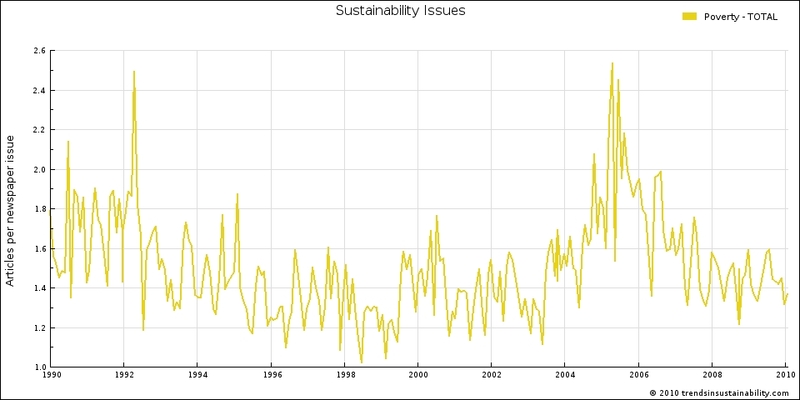 The Trends in Sustainability Online Analysis Tool lets users view handy, interactive charts and data on the number of articles per newspaper issue that contain at least one mention of 10 sustainability-related concepts and 20 key issues in sustainability. 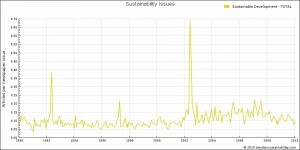 Key issues can be viewed on a world, regional or country level. Sustainability concepts include: sustainability, sustainable development, corporate social responsibility (CSR) and triple bottom line. Key issues include: air pollution, biodiversity, child mortality, clean-tech, climate change, corruption, discrimination, HIV, human rights and poverty. 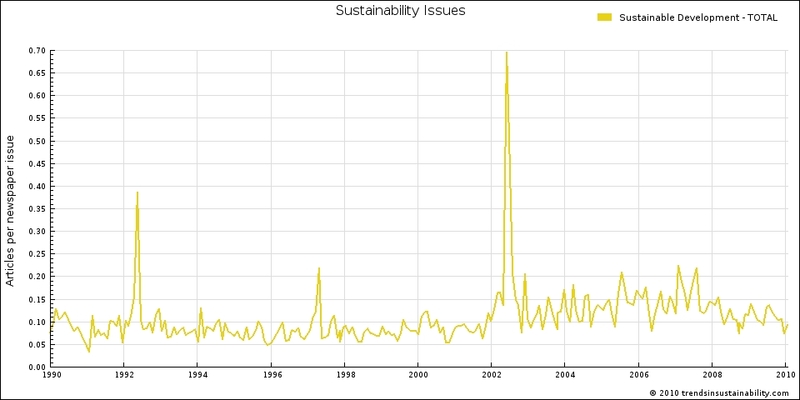 Appearances of the term sustainability look to have leveled off around 2007-08, which likely relates to the issue being relegated to the back-burner somewhat as the world has grappled with more immediate concerns stemming from the global economic downturn. 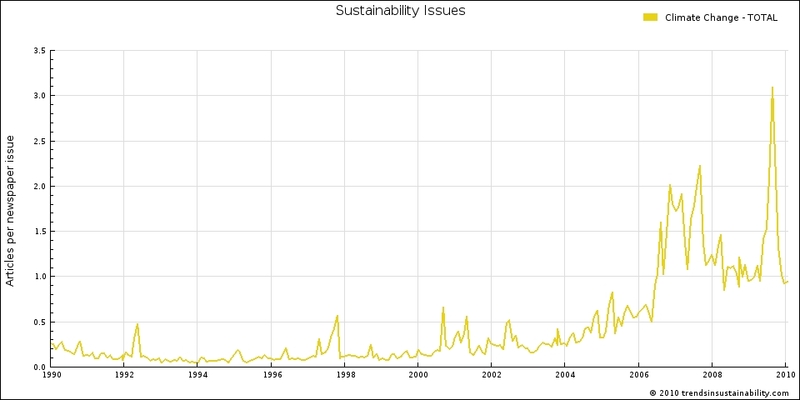 Interestingly, the number of articles containing the term Sustainable Development has only increased slightly by comparison during the early to mid-2000’s before showing a similar leveling off or slight decline around 2008. 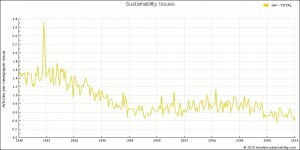 The corporate world’s adoption of Sustainability as an important issue in good global corporate citizenship and public relations looks to partly explain the divergence in appearances of the terms Sustainability and Sustainable Development. 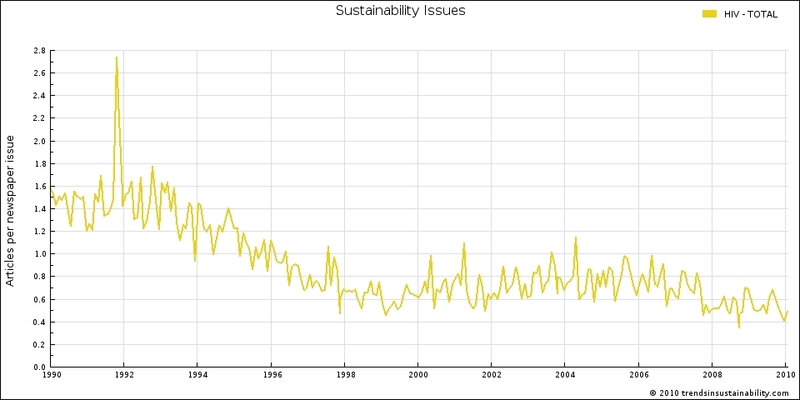 The chart below from the Trends in Sustainability site shows how the number of newspaper articles containing the term Corporate Social Responsibility (CSR) has increased substantially from close to nil around the year 2000 to a still modest, but much higher 0.06 by 2010. This trend fits the expectation that corporate adoption of sustainability issues would lag that of the development community as public awareness and concern for environmental issues catches up with climate change data and the environmental work of international organizations and inter-governmental bodies. The corporate world’s embrace of the Sustainability concept also shows up to some degree in more frequent usage of the term Triple Bottom Line, though adoption of this concept has been less widespread to this point. The Triple Bottom Line concept refers to business ventures or projects of social entrepreneurs that deliver on three objectives: financial return, social impact and environmental conservation. 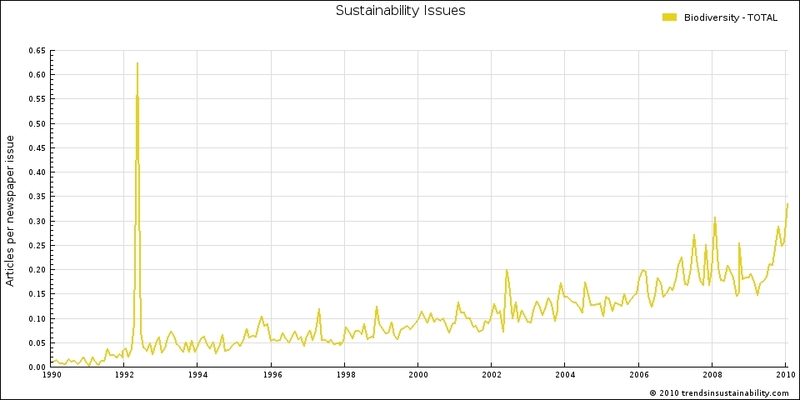 More frequent usage of the term Sustainability may also partly reflect the evolving lexicon of environmental terminology and the adoption and acceptance of different, related terms in the popular press and mass media. 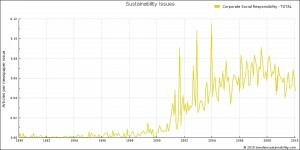 The environmental conservation issue of biodiversity has seen a steady increase in news coverage since 1990 when it hardly showed up in newspapers at all. From next to zero appearances in 1990, the newspaper media’s usage of the term biodiversity has grown to nearly 0.1 articles per newspaper in 2000 and 0.2 articles per paper by 2010. The large, recent spike in coverage of biodiversity issues likely relates to 2010 being designated as the official International Year of Biodiversity and the 10th meeting of United Nations Environment Programme’s Convention on Biological Diversity (CBD). There was an encouraging decline in appearances of the issue of Poverty from roughly 1.75 articles per newspaper in 1990 to between 1.25 (or below) to 1.5 articles from about 1996 to 2004. After a sharp increase around 2005-07, the number of newspaper articles mentioning poverty has fallen back to the previous level of 1.25 to 1.5 articles per newspaper issue. The significant, overall decline in newspaper coverage of poverty from 1990 to 2010 looks to correlate with the substantial increases in Human Development Index (HDI) and living standards in many developing countries during this period. From 1980 to 2010, each Human Development Index for16 developing countries that account for more than 49 percent of the world’s population, including China and India, increased by more than 50 percent. The appearance of newspaper articles mentioning HIV has also decreased significantly since the early 1990’s. By 1997-98, the number of articles containing references to HIV reached roughly 0.75 articles, down from 1.5 articles per newspaper during the period 1990-93. Unfortunately, the trend in newspaper coverage of the HIV issue seems to be more of a function of editorial decisions than a decrease in the number of HIV cases around the world. Data from the World Bank’s Health, Nutrition and Population Statistics database show the prevalence of HIV as a percentage of the total world population ages 15-49 increasing from 0.37 to 0.9 percent during the period 1990-2007. In Botswana during this period, the percentage of the country’s population ages 15-49 living with HIV rose from 4.7 to 23.9 percent. Fortunately, some countries have managed to reverse this trend. In Uganda, the prevalence of HIV among the country’s population ages 15-49 decreased from 13.7 percent in 1990 to 5.4 percent in 2007. 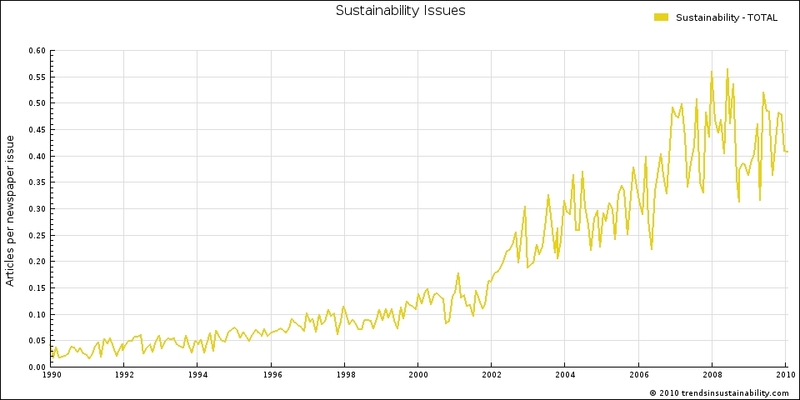 Overall, the available data from the Trends in Sustainability Project present a positive picture of the increasing coverage of important concepts and issues in sustainable development in major newspapers around the world. While it appears we should continue to pay closer attention to evolving HIV issues, there seems to have been substantial progress in addressing a number of other important topics, including sustainability, climate change and biodiversity. Hopefully, the continuation of recent progress in developing countries around the world will continue to bring about substantial reductions in poverty and improvements in living standards.